In a much anticipated judgment, the Supreme Court has ruled that, for thirty years, joint enterprise law has been wrongly interpreted. This judgment does not relate to the principal participant in the crime but to secondary persons on the periphery of the incident. For decades, juries have been directed that a secondary co-accusedâ€™s foresight of the principal attackerâ€™s intention to kill is sufficient proof of murderous guilt. The judgment comes in relation to two joint enterprise murder cases, one in Nottingham, one in Jamaica, for which convictions have now been overturned. The error was traced back to a 1984 judgment by the judicial committee of the privy council. 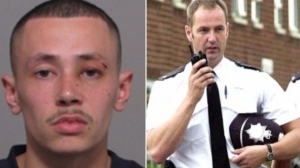 Ameen Jogee [pictured] was convicted of the murder of former police officer Paul Fyfe [pictured] even though Jogee was outside the Leicester house in which Mohammed Hirsi killed Fyfe with a kitchen knife. The Supreme Court ruling sets out the need for the law on joint enterprise to be brought back to the threshold required before 1984, namely to show the intention of murder by any secondary parties. It aims to bring â€œthe mental element required of a secondary party back into line with that which is required of the principal and to bring the law back to the principles which had been established before the law took a wrong turnâ€. "This does not mean,â€ Neuberger cautioned, â€œthat a person who took part in unlawful venture which any reasonable person would realise carried the risk of causing physical harm, and which in fact resulted in death, would go scot-free unless he could be proved to have intended to assist or encourage the principal to inflict death or serious harm. "Anybody who took part in a venture of that kind would be guilty of manslaughter, a very serious crime, at least, unless the death resulted from something which he could not possibly have foreseen. But to be guilty of murder, rather than manslaughter, the secondary party had to have had the intent which I have described." A Commons Justice Select Committee last year suggested many joint enterprise convictions for murder should rather have been for the lesser offence of manslaughter. Its report stated that, between 2005 and 2013, as many as 500 people may have been convicted of murder as secondary parties in joint enterprise cases, many recorded as gang-related attacks. High profile examples of Joint Enterprise convictions include the two men convicted in 2012 for the 1993 murder of Stephen Lawrence, and the three jailed in 2008 for the murder of Garry Newlove. Those convicted under the old foresight rules are now expected to appeal. Jogee's mother, Rachel Whitehead, was pleased. â€œI am just looking forward to seeing him return. I have great sympathy for Mr Fyfe's family, of course I do, I always have. But justice should be done." Gloria Morrison, campaign coordinator for JENGbA (Joint Enterprise: Not Guilty by Association) has campaigned for five years for change and knows of 650 such cases. Jogee will remain in prison while submissions are made for a retrial.